Malta Philharmonic Orchestra Executive Chairman Sigmund Mifsud, Valletta 2018 Foundation Chairman Jason Micallef and Maltese tenor Cliff Zammit Stevens at a press conference held today. Next week will be a special week for Valletta and the music genre, as two major musical events are set to be held in the capital city as part of the European Capital of Culture Programme. 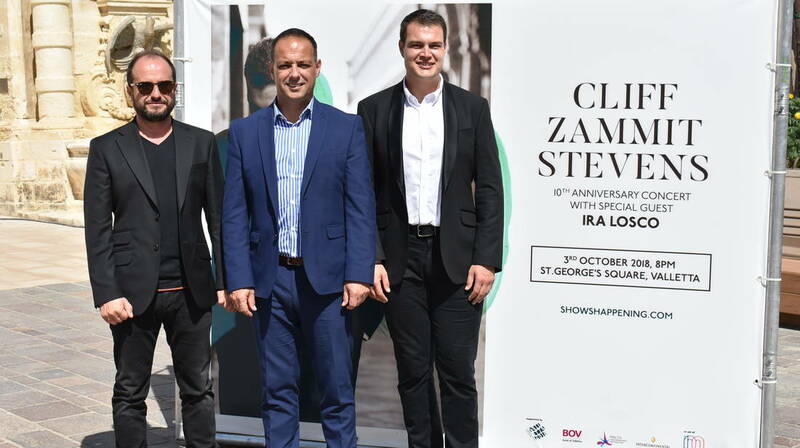 Cliff Zammit Stevens’ 10th Anniversary Concert will be held on Wednesday 3rd October while Notte Bianca will be held Saturday 6th October, with 33 different activities in Valletta taking place over 6 hours, most of them involving music. On the 3rd October, renowned Maltese tenor Cliff Zammit Stevens will celebrate the 10th anniversary of his extensive career by giving his largest annual concert in Malta to-date. The open-air concert, which is supported by Valletta 2018, will take place in the heart of Malta’s capital city, at St George’s Square, starting at 8pm. Cliff will be sharing the stage with local star, Ira Losco, accompanied by the Malta Philharmonic Orchestra conducted by Mro Philip Walsh. Among a number of beautiful songs on the night, the duo will perform their new release, ‘Xemx’. This vibrant celebratory concert will also mark the launch of The Marcy Foundation, set up by Cliff to honour the memory of his mother, Marcelline, with the aim of providing guidance and support to victims of domestic violence, drug abuse, mental disease, HIV and child abuse. To book your tickets visit www.showshappening.com. All proceeds from the concert and from the single ‘Xemx’ will go towards The Marcy Foundation. Three days following Cliff’s concert, the iconic Notte Bianca returns to the streets of Valletta on Saturday 6th October, promising to be bigger than ever as the city celebrates its title as European Capital of Culture. Valletta 2018 Chairman Jason Micallef said that this year there will be something for everyone’s tastes, especially those who love music. A number of iconic locations in Valletta including Teatru Manoel, St George’s Square, Pjazza Teatru Rjal, il-Foss tal-Belt, Fort St Elmo and Strait Street, will be dedicated to different musical genres including Folk, Ethnic music, Electronic, Reggae, Jazz, Tango and Burlesque. Audience favourites taking part include Tenishia, Tribal, Emma Muscat, Ethnic, Lizard Lady, beheaded and The Riffs, among many others. Valletta 2018’s special area Dream Village will be housed at the Lower Barrakka Gardens and is inspired by the merge of Eastern and Western culture, mythologies and traditions, offering a teaser of the upcoming Orfeo & Majnun music-theatre performance (happening on the 19th and 20th October at the Mediterranean Conference Centre in Valletta) and Sfilata fil-Kapitali (a parade happening on the 27th October in the streets of Valletta). The Lower Barrakka will be transformed into a fantasy land where local traditions are presented with a twist whilst visitors explore the garden and stop to build their own fantastical moving animal puppet. Combined with magical lights, music, a children’s festa, film and the dream-inspired theatrical performance – Holm Butik. The village will be an escape from the bustle of the city and everyday life. For more information on Orfeo & Majnun and Sfilata fil-Kapitali, visit valletta2018.org. These events are just two of many others in Valletta 2018’s Cultural Programme happening next week and in the coming months. To stay updated with upcoming events and for more information, visit www.valletta2018.org and follow Valletta 2018 on Facebook.